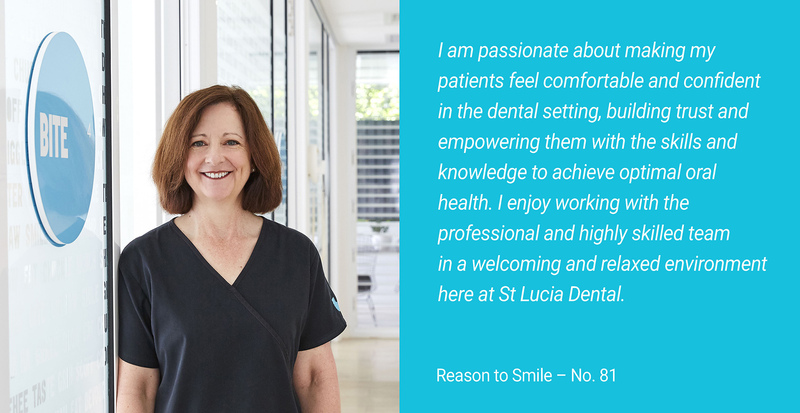 Jennifer is an Oral Health Therapist at St Lucia Dental. Jennifer has 28 years experience in the dental industry, predominantly in the public health sector. Jennifer started her career as a School Dental Therapist on the Gold Coast before moving to Brisbane. In 2004, she completed the Academic Upgrade for School Dental Therapists to become a registered Oral Health Therapist. After completing her Oral Health Therapist training, Jennifer then attended QUT and graduated with a Bachelor of Health Science (Public Health) in 2011. Dental therapy for children and adolescents, Dental hygiene for adults and children.